There is apparently a procedure to eating a tarantula. First comes the inherent panic associated with putting one of the worlds largest arachnids anywhere near your mouth. This phase usually takes the longest and involves a lot of noise making and whimpering. The second phase comes in the form of the reluctant first bite. I say this because I doubt any foreigner has really every sunk his or her teeth into a tarantula without any self doubt. Finally comes the realization that “Hey, this isn't so bad!” This is the best stage because you realize you can say you've eaten something most people only see in their nightmares and realized its not that bad. Its all about the bragging rights though, if were totally honest. How did it taste do you ask? Well let me tell you. It tasted like a giant, hairy heap of fried nothing. That’s right, ladies and gentlemen, it tasted like nothing. It was greatly unpleasant to pick the tiny hairs out of my teeth though. Note to self, tarantula is not an attractive first date food. I will admit that I wasn’t a true adventurer and I did not eat the whole thing. The thorax, as it turned out was not as thoroughly crisp as the rest of my little arachnid friend. I took one bite of that and decided it would serve a much better existence as a projectile from a Tuk Tuk. Note to future travelers: If you decide to eat a gigantic spider….people will stop and stare. We had quite a little cheering squad by the time each person in our group had taken that first tentative bite. So- I made a reservation for a food tour and had no clue that the guide would show up on a moped in 5 pm Friday traffic in Ho Chi Men City. Crazy night included lots of good food and. a FETAL DUCK EGG. Whatever. I ate it... I was in port on a break and was ready to do something extraordinary. Our field class far surpassed my expectations. I expected as a vegetarian to be more of a spectator to observe as my classmates experimented with various Vietnamese street meats. I was so pleasantly surprised to have my expectations proved wrong. I was grouped with other vegetarians from the class and provided such generous accommodations at every stop along our culinary tour of Ho Chi Minh city. Our tour guide was so determined to make sure I was well fed that at one stop she ran off to a market to buy an extra veggie dish to ensure I was included in the feast. My only wish was that I hadn't have eaten breakfast on the ship that morning to save more room for the delightful array of delicacies I would later devour throughout the day. I was so grateful for such a well-planned, tasty, and fun-filled day of learning with my classmates. The day began with an exploration of street markets. Locals sat under umbrella shades amongst their produce selling vegetables, fruits, rice, noodles, cakes, breads, meats, eggs, and even clothing. Our guide bought some jackfruit and some unique cakes and other rice-based treats for us to try. We stopped for brunch and gathered on tiny plastic stools around child-sized tables like the locals. There we tasted iced Vietnamese coffee with sweetened condensed milk, a crispy pancake filled with bean sprouts, fresh spring rolls, and a potato dish all served with fermented soy dipping sauces. I usually hate coffee but I was completely delighted by this Vietnamese specialty. I could have drank three more! We next stopped to taste Banh Mi sandwiches at another tiny street side table set. The guides showed us how the locals eat, opening the crunchy french bread and filling the sandwich with soy sauce, veggies, or eggs and meat for some. Afterwards we meandered through the fresh flower market and then headed to a Pho restaurant called Bánhcanhbéncó. While most students ate traditional pho soup, they brought us vegetarians a delicious bowl of rice noodles and fake meat substitutes made from tofu and wheat. We added savory soy sauce and squeezed fresh limes to complete the tasty noodle bowl Vietnamese style. The rest of the afternoon we spent taking a cooking class. It was by far one of my favorite activities throughout my adventures so far on Semester at Sea. We learned how to cook fresh Vietnamese spring rolls and peanut sauce, green mango salad, and finally lotus fried rice. After we prepared each course we were escorted into another room to enjoy our creations with a cool glass of iced ginger tea. It was so luxurious! I was delighted to learn how to make spring rolls and am so excited to bring home that knowledge to share with my family and friends. The green mango salad was most likely my favorite salad I’ve ever tasted. It was the most delectable medley of green mango, carrots and various fresh spring greens with marinated and grilled meat- substitute strips and sprinkled peanuts all tossed together with a sweet and spicy vinegar dressing. The wheat/tofu based “meat” strips were the most delicious texture and flavor and the salad dressing complemented the savory flavors so perfectly. I cannot wait to make it at home! We were all given a recipe booklet to remember our tasty Vietnamese feast and bring some of the culture home to share. I was so grateful to be able to cook and taste such fresh wholesome foods while gaining insights and understanding of Vietnamese culture. Vietnamese Cuisine… Where Food Benefits EVERYONE! Being in Vietnam was an incredible adventure. The food contained such vivid flavors and I really loved how they used such an array of different vegetable and spices to create a firework display inside of your mouth. 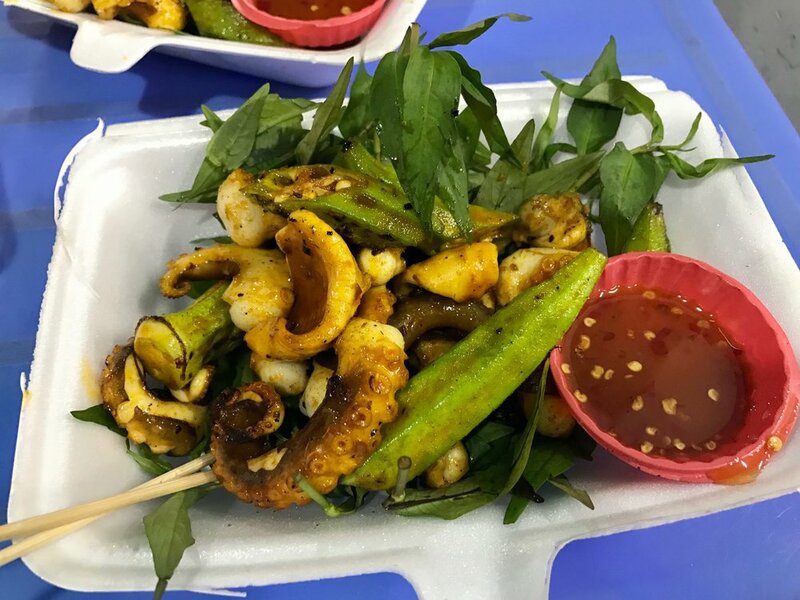 I tried a sampling of food from a few different locations around the country like Phö in Ho Chi Minh City/Saigon, Elephant Ear fish on the Mekong Delta and made Lotus Flower fried rice in a cooking class. With the large access to fresh fruit and vegetables made the food have such an incredible taste and to me really showed the effort that people put into making the food. I had the opportunity to try many kinds of sea food, vegetarian food, river food, and ocean food while being in this country. Everything was a bit of an adventure and all the food was amazing. Vietnamese coffee (picture 3) is incredible thick and super delicious. Being able to add the condensed milk to the incredibly thick and rich coffee was a treat. The Vietnamese people are incredibly sweet and are willing to bend over backwards to make sure that visitors are happy. The hospitality and culture of the people makes me want to count down the days until I get to return. The food in Vietnam was by far my favorite country cuisine yet! 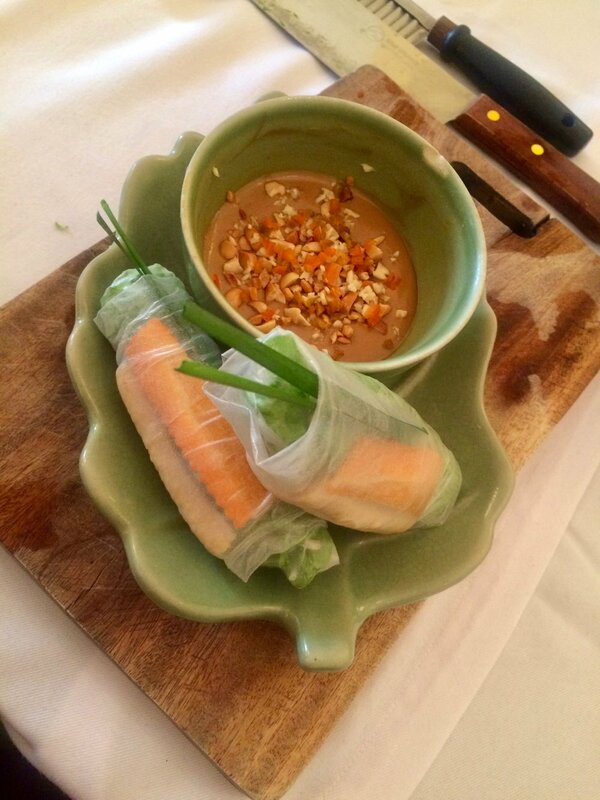 So many vegetarian options offered a diverse and flavorful experience of Vietnamese cuisine. Rather than the simple vegetable dishes that China provided us vegetarians, Vietnam had an array of delicious plates that equally represented the culture while remaining meatless. I experienced an assortment of vegetables, tofus, glutenous imitation meats, noodles, soups, salads, breads, and sweet treats. One of my favorite dishes I tasted throughout my travels was the vegetable spring rolls. This was a roll of spiced vegetables, tofu, mushrooms, bean sprouts, and/or rice noodles tucked up and fried in rice paper. These crunchy rolls could then be dipped in soy sauce to complete the array of flavors. I was lucky enough to see these spring rolls at multiple restaurants and even at a home cooked meal atop the mountains in Sapa during a homestay. During my homestay while trekking in northern Vietnam I was lucky to see how these families live off the land. They cook vegetables and rice that they grow and prepare meat they raise and kill themselves. They created a wonderful feast of traditional Vietnamese dishes for us including spring rolls, sautéed vegetables, duck for the meat eaters, and the most wonderfully flavored fired tofu I’ve ever had. On my final day of exploration, I finally tried Vietnamese coffee. As a non-coffee drinker I was reluctant, but gave in to the hype of this treat. This coffee surpassed all my expectations. It was delightful! It is made with brewed coffee, sweetened condensed milk, and ice. I am so pleased to have opened my mind to coffee beverages after my wonderful experience with the sweet, rich Vietnamese specialty. I have never really been a fan of street food, but the one I had in Hanoi was amazing. The number of restaurants and places to eat around the city is overwhelming – there is no way you can be hungry when you are here. When walking around the narrow streets of Hanoi, you see many people sitting outside in some small colorful plastic tables filled with delicious traditional Vietnamese food. I never understood why the tables were so small, but this peculiar seating arrangement really gives street food in Vietnam some character. In my first street food experience, I sat down in one of those small yellow stools and ordered a stir-fried vegetable pho. I would have gone for the pork or seafood stir-fry, but I was trying not to risk getting food poisoning my last night in Hanoi. The stir-fried vegetable pho was delicious. It was cooked with fish oil and some soy sauce, which gave the vegetables and rice noodles a great flavor. Also I am usually not a huge tofu fan, but in this plate, combined with the different sauces and vegetables, it was amazing. My street food experience did not end here. After eating the stir-fry, I heard someone talking about the “best kebab in Hanoi”. I had to try it. This kebab might actually be one of the best things I have ever tried. Inside the toasted pita it had the meat, tomatoes, cucumbers, onions and cabbage, all mixed with some delicious spicy mayo. Every bite was perfect – you could taste every single ingredient in the kebab accompanied with a spicy flavor. Next time you are in Hanoi, I recommend you go try the “best kebab in Hanoi”, I am sure that if you ask around you will be able to find it. Vietnam was the third Asian country of five on the spring Semester at Sea voyage and my pallet for Asian foods was beginning to waver. Although I enjoy Asian cuisine, I have never had this much in such a short period of time. As I had hoped, I was able to find some amazing fusion restaurants that revived my love for Asian cooking while giving my tastebuds a break from more of the same. While in Hanoi, my friend and I came across a lot of french fusion. For lunch the first day, we enjoyed a 15$ 3 courses of small plate lunch. I started with a chicken appetizer. It was delicious yellow curry chicken and vegetable mix wrapped in sautéed spinach. Next, my friend and I split a tuna tartar started. It was amazing fresh tuna with mango and displayed as a pie using noodles rather than a pie crust. They served it was a side of perfectly baked french baguette. Lastly, I had duck and eggplant. Slices of grilled duck breast with a salty-sweet sauce alternated with strips of grilled eggplant in a flower like shape with garlic whipped mashed potatoes at the center. My friend enjoyed the house sea bass dish. Each bite was better than the next. Needless to say, we had a small dinner. The next day in Hanoi, we went to a restaurant that was highly recommended to us by a friend for another coursed lunch. This restaurant was in a nice area of Hanoi hidden on a side street. It was called La Badiane and had a beautiful atmosphere with bird cage lights and a half open ceiling letting the sunlight and fresh air in. I started with asparagus and cauliflower soup. It was creamy, however still felt light, and had a nice crunch from fresh croutons. 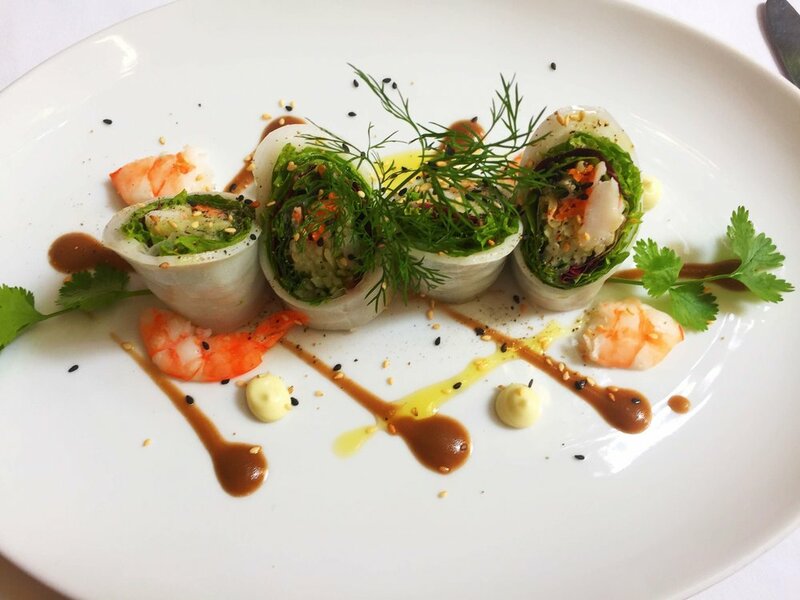 My friend started with traditional shrimp spring rolls. For main dishes, we both had beef carpaccio with french fries. The carpaccio was so thin and light with a fresh arugula salad. The french fries were amazing - perfectly cripsy and hot from the fryer. I have been lucky enough to experience some of the best Asian cuisine throughout my travels, however, sometimes I miss the variety of food offered in the United States. If you had to choose one type of food to eat for the rest of your life, what would you choose? Vietnam was the most relaxed country our voyage has gone to so far—probably due to the insanely cheap beer that seems to flow infinitely. It is also a great place to enjoy an abundance of street food, as well as fresh seafood that is grilled right in front of you. I was able to eat lots of tofu and vegetables that were rarely heavily seasoned, but were always accompanied by soy sauce and a spicy red chili sauce. My first culinary experience in Vietnam was pho, which I was able to get without meat—something that has been surprisingly easy in every country we have been to. I had pho three times in Vietnam and each time it was slightly different. The first time it was just noodles and broth, but after ordering real ‘vegetarian pho’ I received a bowl filled with fried tofu and various vegetables. It was filling and definitely tasty. Nearly everything I ate in Vietnam was delicious: the noodles, the rice, the tofu, the fried pancakes, the grilled street octopus, the spring rolls, and even the pizza. In Vung Tau, a beach town about two hours away from Ho Chi Minh, there were dozens of seafood street vendors within three blocks. Customers could choose from crawfish (that was still moving), snails, clams, octopus, crab legs, even a whole fish. The chosen item was then thrown onto a grill and lightly seasoned with lime, placed over a bed of greens, and served with a spicy sauce. It was a simple but delicious way to enjoy fresh seafood, which is often battered and fried in the United States. Overall Vietnam was a phenomenal culinary experience and I definitely want to go back. I guess I’ll start off by saying that Vietnam was amazing! I loved the people, the places and the food. Overall, I think it was the people that made my experience in Vietnam so memorable. They were all so helpful and friendly that I couldn’t help but enjoy me time wherever I was. I spent most of my time in Ho Chi Minh City mostly exploring and eating food. A friend of mine invited me to go on a motorbike tour. I was a little apprehensive because Vietnam is known for their controlled chaos way of driving. I can honestly say that going on that motorbike tour was the best decision I made while I was there. The people that lead the tour for us were university students and they drove us on motorbikes through the city showing us various popular religious and historical cites as well as some great places to get some Pho and coconut. Everywhere we went on the tour was filled with rich culture and smiling faces. Again I say, the people made the experience memorable. I would definitely go back to Vietnam if I ever get the chance. The cites were beautiful, the food was tasty and the people were welcoming. Just Don't Think About It..
I’m not usually very adventurous when it comes to food, specifically meats that aren’t common in the area surrounding where I live. For some reason, Vietnam made me feel like I should try everything, except seafood of course since I don’t eat it, so that’s just what I did. We ordered some dishes to split between three of us: ostrich stir fry, fried crocodile, and coconut white rice. The rice was absolutely delicious. It was more difficult to eat than normal sticky rice because it was falling apart but there was a pleasant coconut taste since it was cooked inside the coconut and when you got the rice out from the inside, you could scrape the inside walls and get some fresh coconut to eat with your rice. The ostrich had an unrecognizable but amazing taste. A dark meat, it was something I had never tried before and does not just “taste like chicken” which people always joke about. The ostrich meat was more like beef but had a richer, gamier taste to it. The crocodile, on the other hand, had a very similar taste to chicken but the texture was completely different. Crocodile is a very grainy meat and almost seems layered in a sense when you are chewing it. While the taste was delicious, the texture was too odd and unlike my ideal meat texture that I had a hard time eating it. Overall I believed the meal was very good and the view of the water with fish splashing was gorgeous. One thing lasted in my mind the whole time I was eating and continued to linger after the meal, how was I able to eat something that I was feeding 15 minutes prior in its pen? Then my thought shifted to how we treat animals in the United States and how their lives are terrible. These animals have much better lives than they would have in the US, so does this make the situation better?